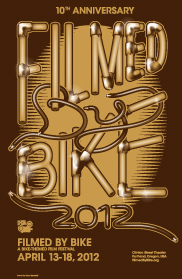 We’ll be at Pedal Nation at the Expo Center all weekend long to tell people about the 10th Anniversary Filmed by Bike. We are selling our DVDs for only $5 (a special show price) and giving away copies of our stellar 10th Anniversary poster, printed by Stumptown Printers. The poster is perforated and breaks into spoke cards and a wrist cuff, which you should wear on opening night. You can print out your own copy of the poster here, but we guarantee it won’t be nearly as impressive as the fine print work Stumptown produces on their printing presses so old they have soul.